"Add a little Jungle to your home." Having always been fascinated by God’s Creation and being especially taken with the intense beauty of jungle wildlife and plants, we have been actively involved in keeping, raising, and breeding many exotics over the past thirty years. 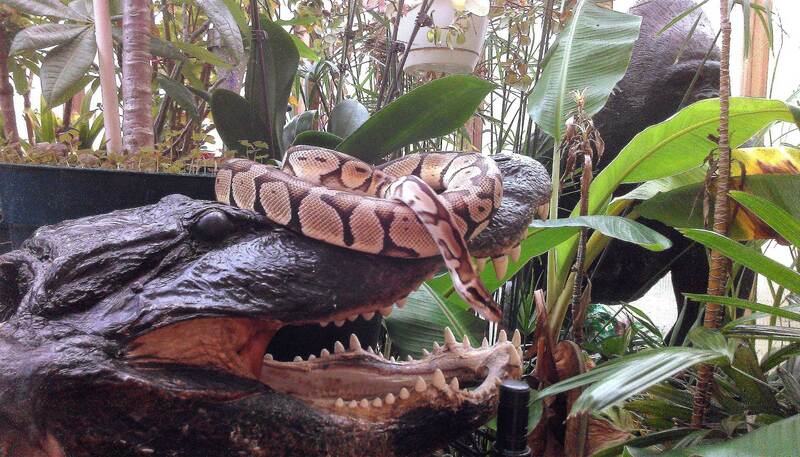 Reptiles, exotic plants, parrots, primates, and Bengal cats have been common occupants of our home. Currently we are involved with several new breeding programs. We have a small group of Ball Python morphs and a group of Corn Snake morphs. We strive to produce healthy, exceptional looking specimens that will make stunning pets or bring exciting genetic possibilities to your breeding program. Since we are a small hobby breeder; we have the time to socialize our babies to insure they enjoy human contact and interaction. We occasionally have other reptiles and amphibians available. Check out our Reptile pages. For the past few years we have also been involved in breeding Sugar Gliders. As often happens, the acquisition of a single pet opens a whole new world of interest and excitement over the new addition. Add to that the variations in colors and genetic morphs out there and it’s easy to understand why breeding them becomes appealing. We really enjoy our Mini-Marsupials and love socializing them the moment they come out of the pouch! Our babies love attention from people and we often take them to the reptile shows we vend at. Enjoy viewing our group of Sugar Gliders. We also have several colonies of Fancy Rats and Fancy Mice. We really enjoy working with various gene pools and producing interesting colors and patterns. These are available to the public strictly as pets. Check out our Rodent pages for some unusual “rat combos” and “mouse morphs”!